This book is for anyone who wants to do any application development in Excel. Even for an old hand at Excel development, a brief skim through reveals valuable nuggets of information. Extensive example codes in VB, C and C++, explaining all the ways in which a developer can achieve their objectives. 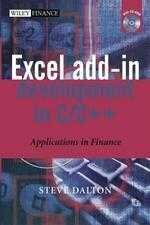 Develops the readers understanding of the relative strengths and weaknesses of developing add-ins for Excel in VB versus C/C++. With several thousand lines of example code, numerous workbooks, and a number of complete example projects. STEVE DALTON is currently head of Exotic Options at Collins Stewart Tullett plc in London. Steve has almost 20 years of experience working in the fields of interest rate derivatives and IT. With a background in mathematics and computing, he pioneered the use of real-time spreadsheets in the mid 1980s for arbitrage and derivatives pricing. He founded Eigensys Ltd in the late 1980s, which specialises in software and consultancy in this field and in the use of Excel for demanding real-time applications.